Last week, we went through the list of Game Day top eight promos from the beginning of the program up through Mirrodin Besieged. Today, we are going to look at the remaining Game Day top eight promos on the list. 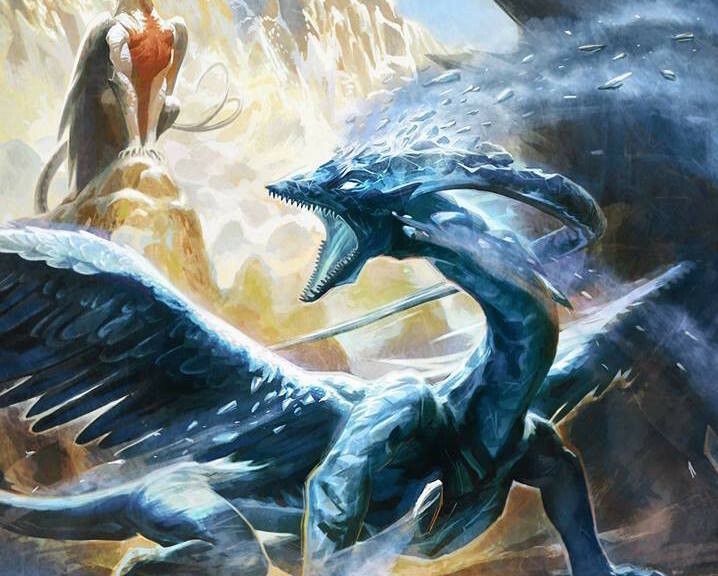 For those who did not read last week’s article (which I highly recommend), the hype surrounding the top eight promo for Dragons of Tarkir Game Day events piqued my interest in reviewing the long-term value of Game Day top eight promos. After all, they are limited in supply, special, and some possess casual appeal. 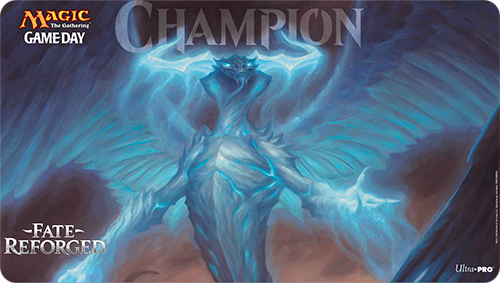 So I dug through the annals of Magic Game Day promos and checked the price of the foil full art promos that were awarded to Game Day top eight players. The metal Tarmogoyf‘s Game Day promo is cheap, with a TCGplayer-mid of $2.27. 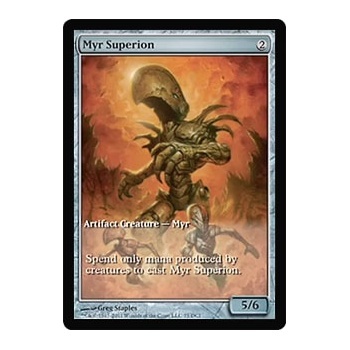 I wonder why nobody has broke Myr Superion in Modern. Imagine the card in a Grand Architect deck: turn-three Grand Architect, tap for a Myr Superion. The deck can even go infinite with the Grand Architect and Pili-Pala combo! I am just kidding, by the way—that is a recipe for a junk deck (as opposed to Junk, as Abzan decks were called before there was Abzan). If I recall correctly, Dungrove Elder was Corbin Hosler‘s pick of the week on an episode of Brainstorm Brewery a few weeks back. He touted it as a casual pick-up, and the price of Dungrove Elder concurred. It’s a card that sees no eternal play, yet its non-foils are $2.79. Set foils are only $3.27 and the foil full-art has a TCGplayer-mid of $4.43. 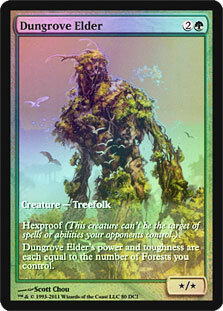 As Corbin pointed out, Dungrove Elder’s foil multiplier is rather low for a card with casual appeal. The full-art foil looks like it has room to grow. Sometimes cards are bestowed a lofty name. Sometimes they live up to it. Sometimes they don’t. 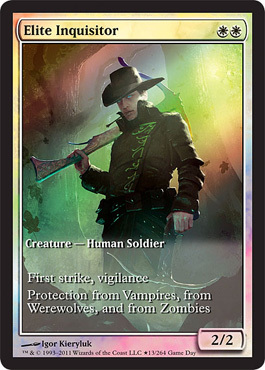 Elite Inquisitor is not elite at all in any format, unless it’s a custom format like humans versus werewolves. And FNMs could be whatever format we want it to be these days right? I was surprised that the foil full art Zombie Apocalypse is only worth a TCGplayer-mid of $3.06. 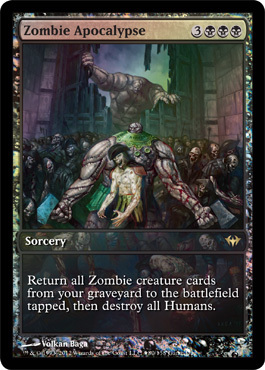 It surely must be a staple in any zombie tribal EDH or casual deck? I had a look at my own copy, and it dawned on me that the last four words in its rules text made the card crap. It’s a shame. Volkan Baga‘s art was sweet. Wizards of the Coast’s choices for Game Day top eight promos for Innistrad block is killing me. Another lamentable reward for making top eight at your local Game Day, Killing Wave is worth only a TCGplayer-mid of $3.77. A little higher than Elite Inquisitor, but nowhere close to some of the earlier promos that are actually worth something. Yet another sweet piece of art wasted. At this point, Wizards seemed to have decided that Game Day top eight promos deserve an exceptional piece of art, and I wholeheartedly commend Wizards for making that decision. My commendation does not extend to their card selection. If only artwork was a significant factor in card prices (compared to printing). Is it too mean to call it Crapborn Horror? 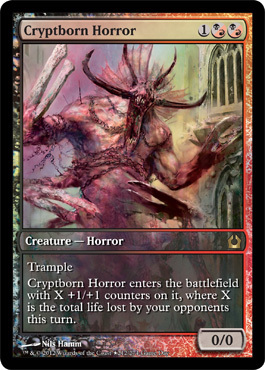 Cryptborn Horror‘s bulk price has granted this the status of being one of the cheapest Game Day top eight promos ever. Finally, we get a card that has the potential to be worth something! 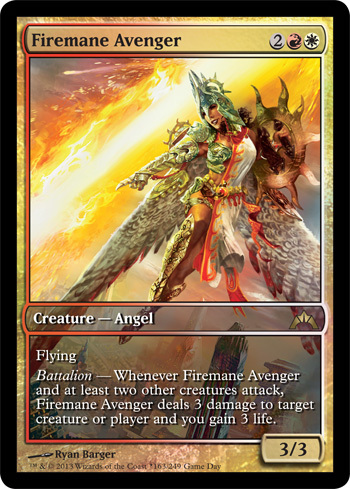 Alas, though Firemane Avenger is an angel, her foil full-art promo only commands a TCGplayer-mid of $3.99. Perhaps her casual appeal is not as high as I expected it to be, but surely an angel who is a Lightning Helix on a stick and is in colors that generate a significant amount of tokens could command significant casual interest? Maybe I am thinking with my Spike cap on rather than my Johnny or Timmy cap. Now this is a Game Day top eight promo that I think is undervalued. 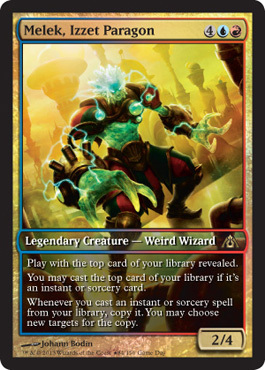 The low price of the promo Melek, Izzet Paragon is every bit as baffling as his creature type. Melek is a very popular general, and I find it weird that the limited edition, foil full-art version of him commands just a TCGplayer-mid of $3.87. We are talking about a foil full-art general here. Unless there is something I am missing, like the discovery of a container full of Melek promos, I think that this card is a good pick-up. 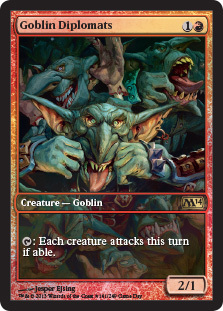 It was as if Wizards was trolling Game Day players by choosing a card like Goblin Diplomats as the prize for the players who fought their way to the top eight of the Magic 2014 Game Day. The jeering goblin kind of rubbed that in. A foil full-art of an uncommon like, say, Young Pyromancer would have been a much better choice. The Game Day Nighthowler has my vote for the most gorgeous Game Day promo. Too bad it’s not one of the expensive ones, with a TCGplayer-mid of $3.52. In this case, I can understand WOTC’s logic in selecting Nighthowler as the top eight promo. 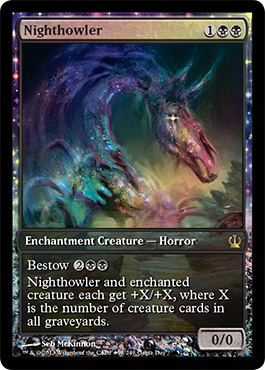 Nighthowler saw a good amount of play in Theros Block Constructed, and it’s a shame that the horsey horror did not manage to find a home in Standard. Nighthowler is quite a decent card. The Pain Seer Game Day promo was the first one for which I went out of my way to obtain multiple copies. I played in multiple Game Days and traded for it, too. Pain Seer is no Dark Confidant, but it was a staple in Theros Block Constructed Mono-Black Aggro, which was a tier-1.5 deck, and I had high hopes for that deck to translate into Standard. Alas, the archetype did not end up performing, save for a brief appearance in the hands of Tomoharu Saito right before Dragons of Tarkir kicked in. Currently, Mono-Black Aggro occasionally graces the MTGO daily events as a super budget tier-two deck. The Pain Seer Game Day promo has a TCGplayer-mid of $3.49. 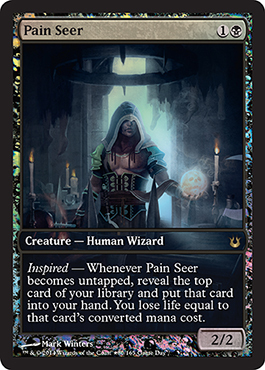 I am tempted to ascribe long-term value to Pain Seer’s promo as a pauper’s Dark Confidant (sometimes the cost of greatness is just too much to bear solely for EDH or Tiny Leaders), but having played with Pain Seer, I think he is a very different creature from The Great One. While not as popular as Dictate of Erebos, Dictate of Kruphix does see play in EDH as a Howling Mine that bestows the extra card on its controller first. The Game Day promo Dictate of Kruphix has a TCGplayer-mid of $3.01. I would not buy it, but I would not mind trading for a couple of copies at this price. Dictate of Kruphix has casual appeal and the promo version could see slow growth over the years. 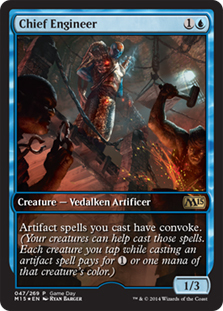 I’m still waiting for Chief Engineer to make artifacts broken in Modern. In the meantime, I’ll just cast my turn-three Wurmcoil Engine off the Urzatron lands, as there’s less risk of getting my board scoured in the process. Chief Engineer’s Game Day promo is hovering at a TCGplayer-mid of $3.04, as it should be. Finally, we reach a Game Day promo that is worth more than $5, in this article at least (in part one, I went through quite a few promos that have a TCGplayer-mid higher than $10). Utter End sees play in Standard Abzan builds as a catch-all answer, which contributes to the promo’s price of $6.18 TCGplayer-mid. 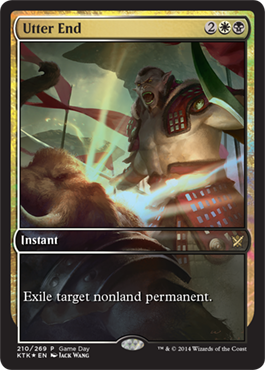 Utter End also oozes casual appeal as a modern-day Vindicate (lands are no-go in this era of Magic design—apparently it feels bad to have your lands blown up). Utter End has the potential for long-term growth, especially the foil full-art version with limited supply. I would not get in at $6, but would instead wait for its price to drop when Khans of Tarkir is about to rotate, at which point I could see getting multiple playsets. Have you seen the price of foil Vindicates? While Utter End could easily be reprinted, the Game Day foil full-art version is probably I’ll we’ll see of this version. Supplant Form was not an exciting Game Day top eight promo, but I doubt many were gunning for the Supplant Form promo at the Fate Reforged Game Day. Supplant Form is a card that was geared towards the casual crowd and at a TCGplayer-mid of only $2.36, it may be worth trading for a few copies as long-term holds. Supplant Form is not a Mind Control effect, but it’s pretty close, and it’s instant speed. Finally, we get to the Game Day promo that puts other Game Day promos to a shame. 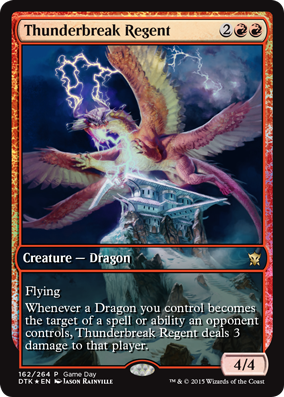 With a TCGplayer-mid of $21.98, the Game Day promo Thunderbreak Regent is the most expensive one to date. The red dragon regent is a heady combination of being both a dragon and a Standard staple. 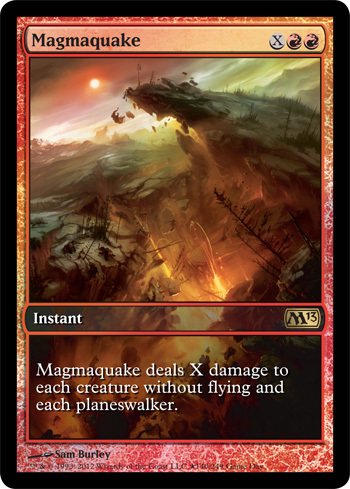 It remains to be seen if Thunderbreak Regent will make the cut in Modern. Nevertheless, I do not see the price of the Regent’s Game Day promo going down anytime soon. 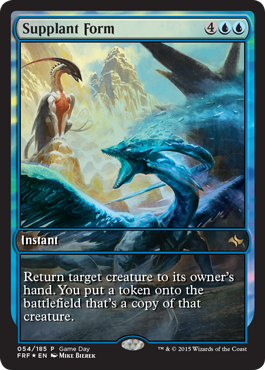 It’s too bad we could not redeem this promo off of Magic Online. I guess I will have to wait until Dragons of Tarkir rotates to pick up the remaining three copies required to complete my playset. This concludes the Game Day Promos series. I hope you have found something useful from these articles, or at least found them interesting (or if you’re really lucky, you discovered that one of your old Game Day promos is worth more than you thought). Feel free to share your thoughts in the comments section below, or catch me on Twitter at @theguoheng. Give Melek a few more years maybe. Dictate also has potential. 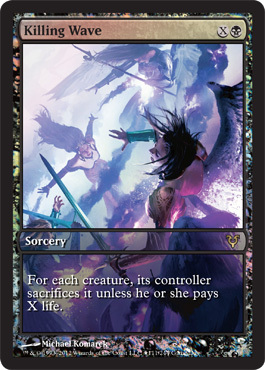 Utter End has the most godawful art, so I wouldn’t hold my breath on that, foil pseudo-vindicate or not. The rest are basically garbage though. Yeah, it takes a while for a card driven solely by the casual market to go up in price, even though it is sorely undervalued. I actually found the Utter End full art to be pretty sweet(heh, love the gleaming light in the middle), but art is subjective. Nevertheless, Utter End’s ability makes it a card that every BW EDH deck would want a copy of. Plus its a budget foil for those who could not afford a foil Vindicate. I played at a small LGS (14 people) for the Thunderbreak Regent. It was pre-selling on eBay for over 30$ at the time (oddly enough, most people pre-selling on eBay had 8 copies… weird). I immediately traded Regent (plus a Chordr of Calling) for an Ugin. My best game day ever. I really hope Wizards decides to stick with Game Day Promos that are played/playable in Standard. Utter End and Thunderbreak are great choices, but Supplant Form? I think Crux of Fate was the best choice for oh so many reasons. It’s a card that defines the set/cycle. But other then that, good choices this last cycle. 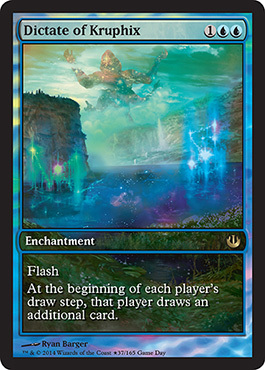 I guess Wizards has to allocate some Game Day promos to the casual/EDH crowd too, hence we still get stuff like Supplant Form. On the bright side, some of these casual-orientated promos would be dirt cheap and the right ones has the potential to grow in the long-term. I like the Supplant Form full art as a casual long-term hold. It’s a super fun card to play, has so many ways to be abused (and absolutely busted in Riku decks).